According to the American Pregnancy Association (APA), roughly 6 million women get pregnant each year just in the United States. Knowing what to eat and drink plays an important role in helping you achieve a healthy pregnancy and safe delivery. Cranberry juice—which packs a hefty dose of vitamin C—provides most pregnant women with an easy way to stay hydrated while minimizing potentially serious health problems. Cranberry juice possesses certain features that may help prevent bacteria from causing a urinary tract infection (UTI) in pregnant women. According to Phyllis Balch, a certified nutritional consultant and the author of “Prescription for Nutritional Healing,” cranberry juice produces hippuric acid in your urine, which promotes an acidic atmosphere in your urinary tract that discourages the growth of UTI-causing bacteria. Cranberry juice also makes the cells lining the walls of your bladder more slippery, which lowers the ability of bacteria to adhere to them. According to the APA, pregnant women are more likely to suffer from a UTI between weeks 6 and 24 of pregnancy. During this time, the rapidly growing unborn baby takes up extra room in your uterus. This leads to extra pressure placed on your bladder, which may keep urine from exiting your bladder freely. The lack of urine flow increases your chances of having bacteria multiply in your bladder and cause a UTI. Drinking cranberry juice during this time in your pregnancy may lessen your chances of developing a UTI. 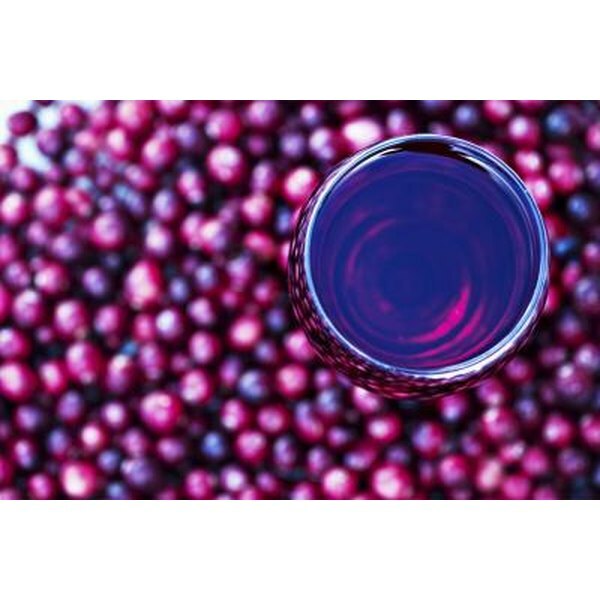 Although drinking cranberry juice may fight off a UTI during pregnancy, don’t rely on it as the sole means of getting you through a UTI during pregnancy. According to Dr. Michael Broder, associate professor in UCLA’s Department of Obstetrics and Gynecology and author of “The Panic-Free Pregnancy,” bodily changes during pregnancy increase your likelihood of developing a life-threatening kidney infection and experiencing preterm contractions as a result of a UTI. Once you notice UTI symptoms, you should arrange an immediate appointment with your obstetrician or midwife for a prompt diagnosis and treatment with an antibiotic approved for use during pregnancy. Signs of a UTI include pain during urination, foul smelling or blood-tinged urine and abdominal pain. Even though it possesses certain benefits for most women experiencing pregnancy, cranberry juice may increase your risk of suffering from some health conditions during pregnancy, namely calcium and oxalate-based kidney stones. If you have a family or personal history of developing kidney stones, the National Institutes of Health recommends you limit your intake of cranberry juice during pregnancy. You can get the maximum benefit from cranberry juice during pregnancy by drinking it plain. It is okay to add a bit of sweetener if necessary, such as honey or sugar, but you should avoid juice mixes, such as cranberry juice cocktail, which drastically cut the amount of cranberry juice that enters your system. Plain cranberry juice is generally sold at natural health food centers.